Two men, rendered as hollow facades, are dressed in period costumes including hats and canes. 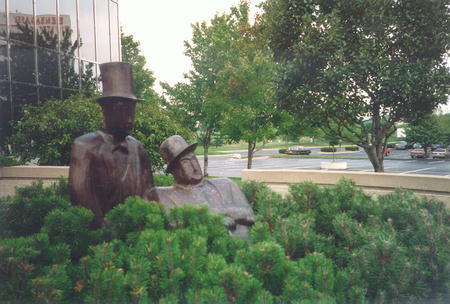 Depicted from the waist up, they stand in a planter amid bushes. : Michael Cunningham, “The Associates,” Ohio Outdoor Sculpture Inventory, accessed April 20, 2019, http://oosi.sculpturecenter.org/items/show/652.